John started his working life as a trainee carpenter and after a short while he joined the Royal Air Force and was trained in Canada. He was sent to Rochford Aerodrome where he met his future wife Kay. During World War II, having previously trained on Spitfires, he served as a Fighter Pilot flying rocket-firing Typhoons. 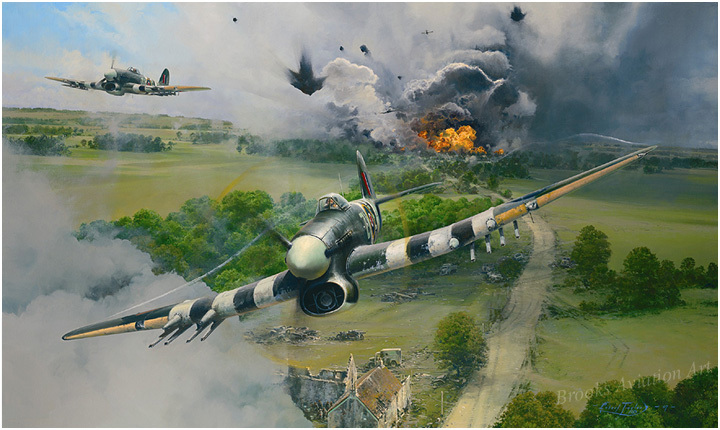 The rocket-firing Typhoon fighter played a pivotal role in the Allies' success in the air and on the ground in World War II, from the Normandy beach-head to the Battle of the Bulge and the final struggle for Germany. He supported the American lead campaign in the ‘Battle of the Bulge’ and on one occasion he was forced down through bad weather and had to bail out by parachute. On Christmas day in 1944, John was shot down but managed to bail out by parachute yet again. Luckily he came down behind American lines and was in time to be treated to a Christmas Day dinner. John had built up in excess of 1000 flying hours by the time he was de-mobbed in 1945. He became a member of the ‘Caterpillar Club’, an informal association of people who had saved their lives having successfully used a parachute to bail out of a disabled aircraft.  1946 - After the war, John was adamant that he did not wish to return to his old carpentry and joinery trade. He applied to Southend Borough Police but did not qualify because he was ½ inch too short, the minimum height being 5ft 10 inches. He then applied for the Metropolitan Police whose minimum height requirement was only 5ft 8 inches.  1947 - Joined the Metropolitan Police and trained at Hendon. At the end of John’s training, Kay was living at Rochford and there were no police houses available. After about a year John transferred to Essex Police and was posted to Brentwood in Essex. They were housed in an old mansion which was used as police quarters. The mansion was called ‘La Plata’ (Spanish for ‘The Silver House’) which had approximately 40 bedrooms. It was empty at the time and quite a lonely, daunting place to live.  1949 – John did not enjoy working at Brentwood and did not get on at all with the Superintendent. The situation got so bad that John was transferred out to the remotest of locations in Great Wakering. Unbeknown to the Superintendent this suited them down to the ground since Kay came from Rochford.  1951 – John & Kay moved into a brand new semi-detached police house, 290 High Street, Great Wakering. Next door at Number 288 lived PC Ken Griffiths who had already moved in and had been the policeman for Great Wakering for several years whilst living in Little Wakering at the time. His only form of transport in Great Wakering was his bicycle. At the time, the level of pay as a serving police officer was so low that John started to do casual carpentry jobs in the village to supplement his income, despite this being frowned upon by the police authority. 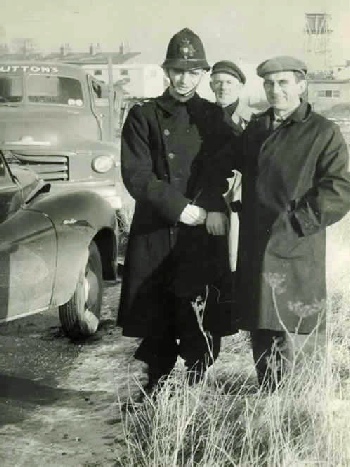  1955 – John enjoyed his job in the police at Great Wakering but could just not afford to stay so he decided to resign and get back into the carpentry trade. On leaving the force they had to give up their brand new home so they rented an old house in Little Wakering Road. Giving up their nice new home saddened Kay but she realised that there was no option; the house came with the job. Initially John found it was quite a struggle to get enough work to earn a decent wage but eventually some lucrative work started to pick up at Coryton. Several years later, John was able to start his own business initially building exhibition stands for Olympia. Kay had opened a small shop in Little Wakering Road to supplement the household income but by 1980 business had declined. They eventually bought a house in Southend and Kay took on more permanent employment including working as a clerk/typist for the Southend Courts for five years.  1984 - John died suddenly of a brain haemorrhage.  1985 - A year after John’s death some Belgians excavated the area where John was shot down and came across his plane. Kay was fortunate to get to see parts of the wreckage and to this day she exchanges Christmas cards with one of the Belgians involved in the excavation.  The Floods of 1953 –John Marshall and Ken Griffiths both went over to Foulness Island in rowing boats to help get people off the island since it was so badly flooded. Kay and Ken’s wife Vera manned the telephones at the Police Station. Kay remembers distinctly a local farmer ringing through in distress to say that their cattle were drowning and dying.  The Police station occasionally housed stray and injured animals and clearly remembers somebody bringing in a ‘Barn Owl’. Night-time had arrived and they were still waiting for the RSPCA to call but they happened to open the door and the owl flew away.  Kay remembers John’s colleague, Ken Griffiths who one night was coasting along on his bike and he could sense something white over his shoulder. He looked around and saw a white owl flying alongside and close to him for quite some distance.